Thanks for Helping Our Kids Go Back to School! Our Seasonal Programs Manager Joanne Walton, with "Abby" and "Jane," who love their new backpacks and supplies. Britepaths is so grateful to everyone who supported our Collect for Kids Back to School Program this summer! 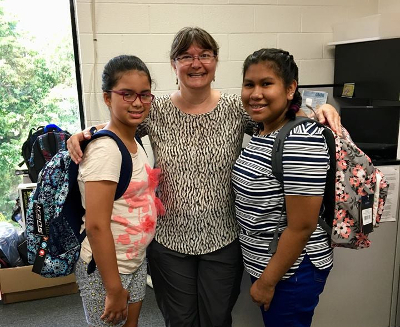 Thanks to you, 2,500 students in need at our Fairfax County Public Schools partner schools will start off the school year with dignity, and all the supplies they need. In addition to Program Sponsorships and financial donations to purchase supplies, we received more than 600 backpacks and 22 calculators, all of which have been distributed to our partner schools, listed at the bottom of this page. Thank you to 24 Hour Fitness Falls Church for hosting a fun Zumba event on August 18, 2018 to benefit our Program! Thank You to Organizations That Ran Donation Drives! Thank You to Organizations Who Served as Backpack Collection Sites! Please Keep Us In Mind for Summer 2019! We will need Program Sponsors, Backpack Collection Sites, Donation Drives, and donations of funds, backpacks and scientific calculators. Wonderful service opportunity for companies, community organizations and faith/youth groups! Britepaths' Program is in cooperation with Fairfax County's Collect for Kids Partnership. Visit our Collect for Kids Back to School page to learn more about our Program.